By the mercy of the most compassionate Sri Gaurasundara this book, Sri Mathura-mahatmya, compiled by Srila Rupa Gosvami, who was one of the associates of Sri Guranga, has been published. It was the utmost desire of Srila Bhaktisiddhanta Sarasvati Gosvami Prabhupada that at least the literatures written by the Gosvamis be printed. Lord Gaurasundara, the deliverer of the fallen souls in this age of Kali, has counted the limb 'residing at Mathura' as one of the five principle limbs of devotional service. Therefore the principle fruit of visiting, circumambulating, and residing at Mathura is the fifth objective of life called love of God. But keeping different qualifications of the devotees in the mind, Srila Rupa Gosvamipada has included various processes of devotional service such as devotional service mixed with karma or jnana by quoting statements from various scriptures. In this way he established that Mathura vanquishes all one's sinful reactions and awards piety and liberation. According to the statement of a Mahajana, citta drdha hana lage mahima-jnana haita- "One's mind becomes fixed by understanding the glories of the Lord," the neophyte devotees' faith will certainly be strengthened by studying this Mathura-mahatmya. There is no doubt that this book compiled by Srila Rupa Gosvamipada under the instruction of Lord Sri Gaurasundara will be highly regarded by the intelligent readers. A life sketch of Srila Rupa Gosvamipada has also been included in this book. Our only goal of life is to receive the dust from the feet of the Vaisnavas who strictly follow the path exhibited by Sri Rupa. If the merciful readers relish this book and shower blessings on us, then our attempt will be successful. Among the sakhis who are subordinate to Srimati Radharani, Lalita is the principle, and among the manjaris who are subordinate to Lalita, Sri Rupa-manjari is the principle. Also in the pastimes of Gaura, Sri Rupa Gosvami was prominent among the six Gosvamis who were subordinate to Sriman Mahaprabhu. Sri Rupa Gosvami Prabhu remained in this world from 1498 to 1558. The genealogical table of Rupa Gosvami can be traced back to the twelfth century Sakabda, when a gentleman of the name Sarvajna appeared in a very rich and opulent brahmana family in the province of Karnata. He had two sons, named Rupesvara and Harihara, who were both bereft of their kingdoms and thus obliged to reside in the highlands. The son of Rupesvara, who was named Padmanabha, moved to a place in Bengal known as Naihati, on the bank of the Ganges. There he had five sons, of whom the youngest, Mukunda, had a well-behaved son named Kumaradeva, who was the father of Rupa, Sanatana, and Vallabha. Kumaradeva lived in Phateyabad, an area bordering Baklacandradvipa in East Bengal (now Bangladesh). The present-day village of Prembagh, which lies near Ramshara in the Jessore district of Bangladesh, is said by many to be the site of Kumaradeva's house. Of his many sons, three took to the path of Vaisnavism. Later, Sri Vallabha and his elder brothers Sri Rupa and Sanatana came from Candradvipa to the village in the Maldah district of Bengal known as Ramakeli. Both Rupa and Sanatana were highly learned scholars of many languages such as Sanskrit, Arabic, and Persian. After seeing their ingenuity and expertise, the then King of Bengal, Nawab Hussein Shah, employed Sri Sanatana in the post of Prime Minister and Sri Rupa as the Revenue Minister. Being extremely pleased by their qualities the King awarded the titles Sakara Mallika and Dabira Khasa to them respectively. Although they became famous as expert ministers for social welfare they did not care at all for profit, adoration, and distinction but spent their times in spiritual cultivation. During their stay at Ramakeli they accepted as their teacher Madhusudana Vidya-vacaspati, the younger brother of the renowned scholar and Sriman Mahaprabhu's dear associated Vasudeva Sarvabhauma, and in the absence of royal duties they studied devotional scriptures such as Srimad Bhagavatam from him. During this time Srila Rupa Gosvami Prabhu composed the book Hamsaduta. After accepting sannyasa, when Sriman Mahaprabhu went to Nilacala, at that time these two regularly sent messengers with humble entreaties for achieving darsana of the Lord's lotus feet. By their heartfelt appeal Sriman Mahaprabhu arrived in Bengal on the pretext of seeing His mother and the Ganges on His way to Vrndavana. The first meeting between Sriman Mahaprabhu with Sri Rupa and Sir Sanatana took place under the tamala and kadamba trees in the village of Ramakeli. At night Dabira Khasa took off his royal dress and after taking a bunch of grass in his teeth came before Mahaprabhu and offered his respectful obeisances to him. The Lord picked him up, embraced him, and gave him the name Sri Rupa by accepting him as His eternal servant. Sriman Mahaprabhu instead of going to Vrndavana on that particular visit went up to a place called Kanayera Natasala and returned to Nilacala. Meanwhile Sri Rupa gave up his royal duty and went home. He duly divided all his wealth and distributed it. When Sri Rupa heard that Sriman Mahaprabhu was it Jharikhanda on way to Vrndavana, he too departed for Vrndavana with his younger brother Anupama. After visiting Vrndavana, Sriman Mahaprabhu came to Prayaga. Sri Rupa and Anupama met Him there. At the Dasasvamedha bathing ghata at Prayaga, Lord Sri Caitanya Mahaprabhu instructed Sri Rupa Gosvami continuously for ten days regarding the conclusions of devotional service and the science of transcendental mellows. Sri Caitanyadeva ordered Sri Rupa Gosvami to visit Vrndavana. According to the order of Mahaprabhu he went to Mathura and met Subuddhi Raya, who was a recipient of the Lord's mercy, and a Sanodiya brahmana who was a disciple of Sri Madhavendra Puripada. In their company, Sri Rupa circumambulated the eighty-four krosa Vraja-mandala. Later, on the way to Nilacala through Bengal, Sri Anupama left his body on the bank of Ganges. Sri Rupa desired to compose a book on drama regarding the pastimes of Sri Krsna. But while coming to Nilacala he was ordered by Satyabhama-devi in a village called Satyabhamapur to describe the pastimes of Vraja and Dvaraka separately. 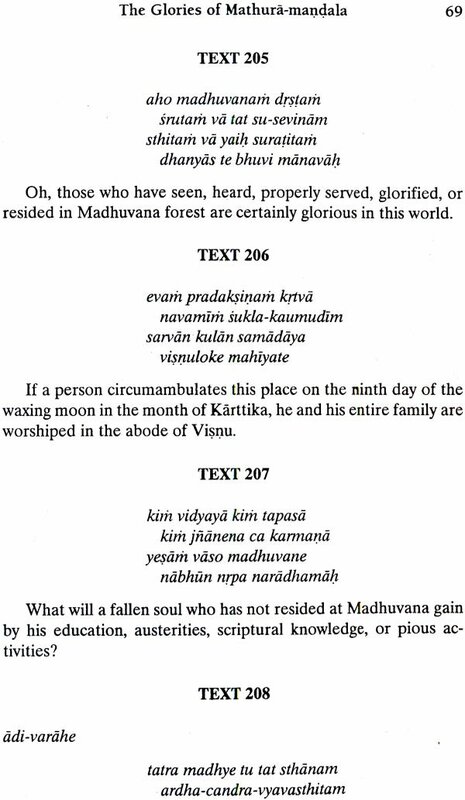 Being ordered in this way Sri Rupa composed two separate drama books called Sri Vidagdha-madhava and Sri Lalita-madhava. "Taking a straw between my teeth I repeatedly beg for the dust of Sri Rupa's lotus feet birth after birth."